Call Today! (512) 900-4049 Care. Trust. Excellence. Dental Smiles > Blog > Teeth Whitening > Where can I get an Austin Teeth Whitening? Where can I get an Austin Teeth Whitening? Having a whiter, brighter, and a more vibrant looking smile is one of the simple pleasures in life that your local dentist can help you achieve. If you have been considering the benefits of cosmetic dentistry, Dr. Shetty and her staff at Dental Smiles are an excellent resource for the best options in care. Providing the highest quality of dental services, we have helped many patients transform the appearance of their smile and we are confident we can do the same for you. Employing the latest technology, techniques, and advanced methods of care, we offer a comprehensive range of services in cosmetic dentistry including: tooth-colored fillings, Austin teeth whitening, dental veneers and full-coverage crowns. New patients are always welcome to our state-of-the-art facility, where we look forward to getting to know you and your loved ones. 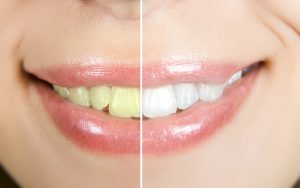 When it comes to enhancing your appearance, a whiter and brighter smile can make a dramatic difference. For many patients, a professional teeth whitening treatment affords an excellent means of attaining a more beautiful smile without the need for more advanced or invasive approaches to care. At Dental Smiles, we are committed to providing our valued patients with the highest degree of individualized attention. After analyzing your smile, our dentist will work with you to develop a treatment plan that delivers an aesthetically pleasing and healthy treatment outcome. If you opt for an Austin teeth whitening procedure, you have two different options from which to choose. Our in-office procedure can dramatically lighten and brighten your smile by up to 8 shades in as little as an hour, while our take-home kit can be worn day or night to achieve a pleasing outcome of care a bit more gradually. If you are considering Austin teeth whitening or any other cosmetic dental procedure for your smile, pay a visit to the professionals at Dental Smiles today. For more information and to schedule an appointment, give our office a call. Our practice is committed to providing high quality, friendly service in a gentle and caring environment using state-of-the-art dental materials and technology. We strive to create lasting relationships and to take care of each patient and their oral health for a lifetime.